Choosing the right domain name for your company is critical for success, if it's too long your customers may not remember it, how does it look in print or on the side of a van? all things to consider when choosing a Domain Name. A domain name is your identity on the Internet, and it connects a user to your website. Websites are basically numbers on a server, these are known as IP addresses such as 213.5.41.12.3 this will be the physical address of a website, having a domain name allows you to connect it to your website so the domain acts as an address pointer such as www.mydomain.co.uk > 213.5.41.12.3. Take your time when choosing a domain, your primary business name may not be available so look for alternatives, there are now hundreds of other domain extensions available such as .plumbing, .shop, .pub as well as the standard .com and .co.uk. If you are advertising your domain name in print which could be on letterheads, on the side of a van, on a banner or even on a tee-shirt, try writing your domain out and see how it looks. Your domain name does not need to be the same as your business name, for example B & Q have the domain name www.diy.com. Having multiple domains which could be variations such as, mydomain.co.uk or my-domain.co.uk can be useful, think about the user and how they might read your domain. 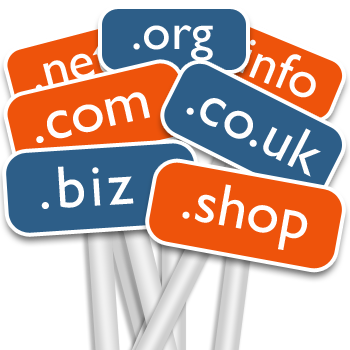 It can sometimes prove wise to have an extra domain with separations such as hyphens (-), for example : my-domain-name.co.uk if you are going to advertise your website on printed media such as business cards, signs, clothing or vehicle signage, making your domain readable will help the user remember it better. You can have many domains pointing to the same website, however search engines will only list your primary domain.